....a $224,000 car seat. cover. UPDATE: The price for this item has since (not before) been changed to the much more reasonable price of $224. However, be sure to read the very interesting comments for a good laugh.... comments have now been turned off due to the website owner's leaving threatening and abusive comments, which have been deleted. If, after reading the comments I've decided to allow, you would like to let Ms. Oddo know your feelings about her level of professionalism, you may E-mail her directly at info@taylorsbaby.com. For your information - that is the manufacturers required retail price - before you single one website you should look into the 15 retailers carrying the same line plus the manufacturer that are charging the same price - you are buying a custom made to order car seat from the highest quality fabrics - that comes with a price tag. If consumers weren't willing to pay for that customized product - it wouldn't be selling. Wow, Sarah, seems like someone has their knickers in a knot over your post. And to Jacqueline, yes, I know it would be the MSRP, and it IS a custom piece, but it's still a bit ridiculous. That said, there are people who will be pay it. Hi. I'm just wanted to point out to you that you have posted a blog that is not true. In the blog entry, you wrote that this seat cover was $225,000. I couldn't believe it at first so i clicked on the link. I read the page to find out the seat cover- which is not to mention, a beautiful custom handmade seat, that is made from high quality fabrics- is only written as $255.00. Jaqueline is right, you shouldn't single out one website for this because I have seen other websites carrying the same item for the same price of $225.00. Jaqueline and anonymous, you both need to calm down and get a sense of humor. I looked at the site, before it was CHANGED, and it did in fact say $225,000, which Sarah was obviously poking fun at. Or are you defending that price, Jaqueline? The seat cover is quite cute and probably worth the $225 to many, many people. $225,000 is FAR too much to charge for a car seat cover, unless that happens to be real giraffe fur. Which I sincerely hope it is not. That said, $225 is a much more reasonable price. Perhaps bloggers like myself would not have opportunity to ridicule (or should I say, give free publicity to?) your products if your proofreading department were performing their jobs at a much higher accuracy rate than they seem to be. Glad I could catch that little snag for you. Convenient how they were snarky enough to bash you for what amounts to pointing out a typo...but not ballsy enough to own up to the fact that, yes, $225,000 for a seat cover is in fact ridiculous. As it is, $224, even $225 is not unreasonable at all, and people who comment (and even those who don't) regularly pay higher prices for luxury and custom goods. It might be a better idea to own up to the mistake of their original typo, and maybe even snag a couple of customers, than berate you for pointing out their lack of proof-reading, all while quietly changing it in the background, then anonymously posting after their fix that you were lying. Oh, and Pink Taffy Designs sells the exact same thing for $195. Pink Taffy is listed at the same retail price - double check your facts. would be to contact us to point out a typo. Instead you chose to ridicule the situation. uncalled for. Have you ever heard of human error? to your blog what was obviously a human error. without your negative publicity from you. can judge my staff and proofreading department. And once again please stop with your nasty, demeaning emails to our company and your threats to send it into David's Letterman as a "stupid typo"
As stated to you previously - this matter is closed. But seriously, let it go already...this is a fun blog, and while it could have easily been a laugh for all, you included, you had to make it ugly, and only God knows why. 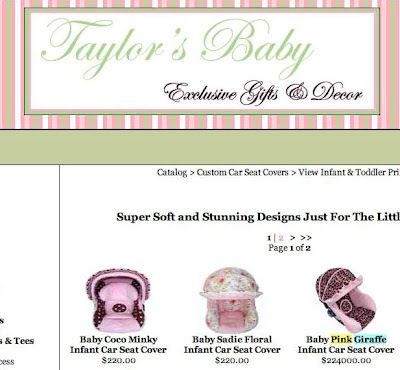 I'd love to take this opportunity to encourage everyone: Shop taylorsbaby.com! Who knew this would be my most popular post ever????? Now let's take a vote: Letterman it, or not? Some people just can't say "oops, I made a mistake". Your original post didn't single anyone out, just provided a link. The woman that owns the place needs to get a grip. It's not like you're a rival or anything. After her hysterical response to all of this I'd say send it to Letterman...along with her snide comments.